The global market for intraocular lens is highly consolidated in which the top five companies accounted for a mammoth share – about 80.5% - in 2016. The market dominance of the top five players, namely Abbott Laboratories, Terumo Europe NV, Boston Scientific, Inc., Biotronik, and Biosensors International is in large part due to their wide geographical outreach. The leading players are slated to up their ante further in the upcoming years by carrying out clinical trials to prove the superiority of intraocular lenses over other products. They are expected to expend a lot of energy and money on research and development to unveil more cutting-edge products with multiple benefits. As per a research report by Transparency Market Research, the global market for intraocular lens was worth US$3.2 bn in 2015. By expanding at a steady CAGR of 5.2% between 2016 and 2024, it is predicted to attain a value of US$5.0 bn by the end of 2024. The global market for intraocular lens can be segmented on the basis of end-users into ophthalmology clinics, hospitals, eye research institutes, and ambulatory surgery centers. Among them, the hospitals segment accounts for maximum share in the market. In 2015, for instance, it held a share of 36.4%. In the years ahead, however, the segment is predicted to lose its market share to ambulatory surgery centers and ophthalmology clinics. The latter two segments are forecasted to clock higher CAGR from 2016 and 2024 due to the soaring popularity of outpatient settings which help facilitate faster cataract surgery and the ease of access to ophthalmology clinics. Based on geography, the key segments of the market are North America, Europe, Asia Pacific, Latin America and the Middle East and Africa. Of these, North America holds a leading position because of rising instances of cataract, swift take-up of technologically advanced products and techniques, and growing demand by patients for premium intraocular lens. Europe trails North America in market share. In terms of growth, on the other hand, Asia Pacific is predicted to outshine all other regions with a CAGR of 5.7%. Factors underpinning the growth momentum in the region are high occurrence of diabetes which often results in cataract, different initiatives undertaken by governments to cure cataract, and a fast-expanding refractive surgery market. 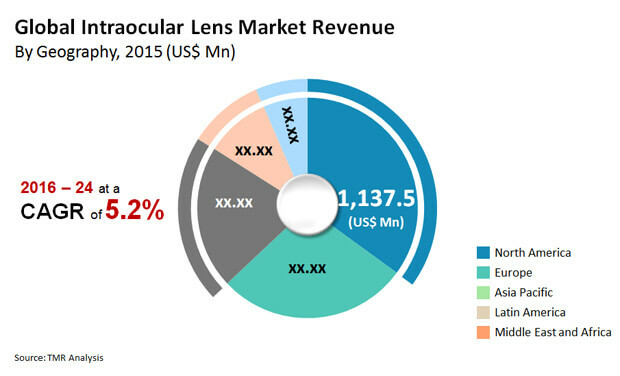 At the forefront of driving growth in the global market for intraocular lens market is the spike in ophthalmic and ocular conditions across the world. “The American Association of Ophthalmology (AAO) states that cataract will continue to be the most popular condition responsible for visual impairment in the coming years. The increasing pool of geriatrics, who are susceptible to ocular conditions will also be responsible for the growth of the global intraocular lens market. The increasing awareness amongst the aged about issues associated with impaired vision is also expected to drive the global market in the coming years,” explains the lead analyst of the report. The swift uptake of premium intraocular lens has also been stoking growth in the market in the recent past. Such premium products are a result of continued technological progress and innovation. High prices of such high-end products have done little to dampen their demand. This is because benefits offered by premium intraocular lens such as better vision, lesser rates of astigmatism, and better spectacle independence far outweigh the disadvantages of steep price.